If you’re a serious comics collector, have you ever felt the urge to pin up some of your collection to a prominent wall in your home? You know, just so you can enjoy the spectacle? Well, that is exactly what a real estate agent and a production designer did when they set out to create a show stopping wall to enhance a property for sale. If you’re in the Los Angeles area and in the market for a beautiful home in Silicon Beach, then this is especially for you. The home was listed on May 11. The following press release is enlightening inasmuch as it’s an interesting example of how comics are valued in our society. The memories, the power of myth, it’s all priceless. 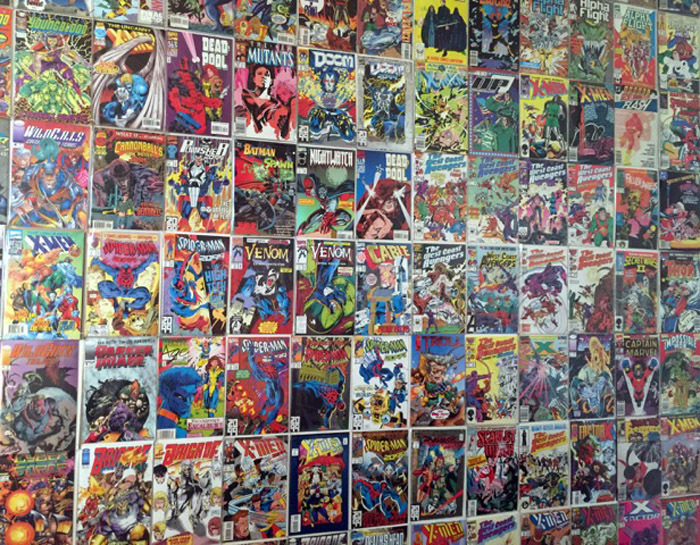 HGTV’s Matthew Finlason tore into his own personal $10,000 collection of comic books to make this altar to comics happen. A wall of 250 superheroes is a drop dead moment in a sleek gem of a house for sale in Silicon Beach in West Los Angeles. 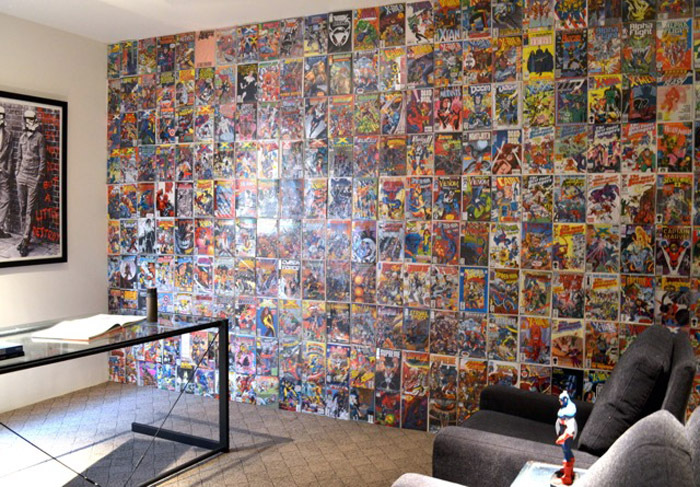 A $10,000 comic book collection wall in a $3.5 million house. The Amazing Spiderman, The West Coast Avengers and the XMen are just a few of the colorful characters in 250 vintage comic books that line a wall in the multi-level contemporary home at 25 South Venice Boulevard, a block from the beach. Real estate agent Darren Winston of John Aaroe Group knew he had to find a stager who could get the mindset of his most probable buyer — a young successful technology or entertainment innovator/entrepreneur. When he met Matthew Finlason, who has great credentials including HGTV but also shared his vision for staging the house to fit the lifestyle of the prospective buyers, he knew he had found the right partner. The house had one rather conventional room that Winston and Finlason decided would work best as an office. That’s where inspiration hit and Finlason decided to tap some of his comic book collection to create a show stopping wall. Finlason had collected comic books for 40 years, starting when comics were only 75 cents. He says some had not seen the light of day for 25 years. Somewhere in one of them is a treasure map that will lead you to magical stones that he buried in a forest in Toronto. “X marks the spot,” says Finlason. Many who have grown up with Jedi and Comics for decades, some in their 50’s and 60’s, would find this office as appealing as younger comic heads, believes Winston. Finlason says he knew right away he was going to break out the collection for this home. “By installing a comic book lifestyle, marrying it with Banksy pop art, modern furnishings yet traditional touches, we turned one of the more uninspiring rooms into a highlight,” Winston notes. “I’ve been a comic collector since I was 10 and have hauled 10 boxes of every title you could imagine. I randomly pulled these – there is no sequence or scheme to it. Some are number ones some are old, Marvel, DC, Image. Some are mint, some in rough shape and some I was too afraid to put on the wall,” reports Finlason who pinned each individually and carefully to the wall. It took eight hours and he missed his vacation flight to Mexico City to complete the work. Winston was on-site every day of the three weeks he spent getting the house ready to be shown. He coordinated all of the interior painting, putting 10 painters to work, even on the week end. He directed them to start at the first floor, moving up one floor at a a time with Finlason coming in behind with furnishings, accessories and art. The home was listed on May 11. With its compelling contemporary design, huge rooftop terrace with stunning ocean and city views, five fireplaces and flexible spaces, the home likely will be snapped up quickly by one of the tech literati moving into Silicon Beach. Priced at $3,750,000, the 3,800-square-foot home is a legal duplex that the previous owner converted into a live/work home so it’s perfect for so many of today’s techies whose work life goes 24/7. The comic books go with the house if the buyer is an aficionado; price upon request. Based in the Aaroe Group Beverly Hills Office, Winston is a top selling agent of luxury homes for the past 12 years. Wow that’s a deal closer if ever I saw one!